With half of the top 10 anglers in the FLW Tour event on Kentucky Lake throwing the Nichols Ben Parker 8" Magnum Flutter Spoon, it's a winner for sure. It also took home the BASS College Wildcard event on Lake Pickwick. 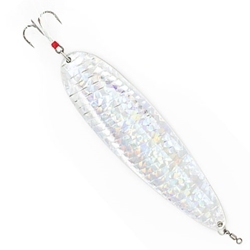 Featuring a Nickel Plate Chrome design, a premium 4/0 EWG Short Shank Trokar Treble tied with Pearl Flashabou, and finished with a Size 4 Spro Power Swivel at the top, this spoon is ready to fish out of the package.